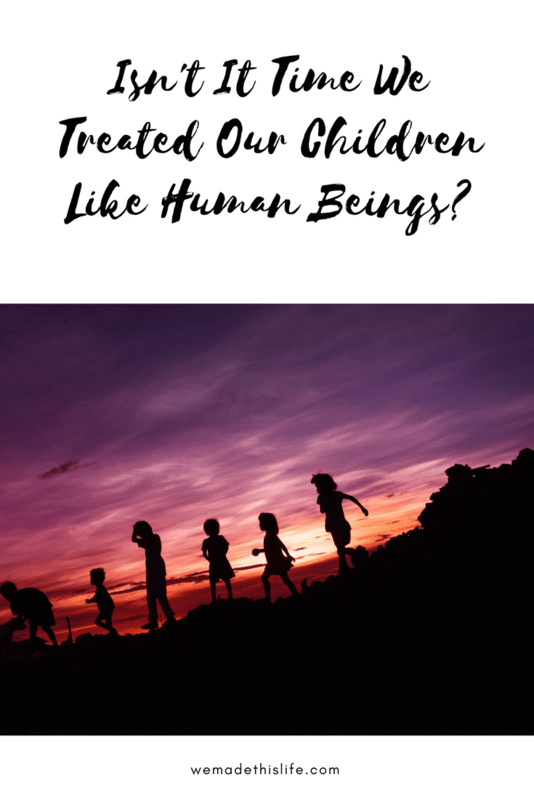 Isn’t It Time We Treated Our Children Like Human Beings? I have three little people that I love and respect more than I do anyone else. From the moment that they were born I have taken care of their every need, listened to them, and helped them to grow up into awesome little humans. I don’t take all the credit for who they are though, they are people in their own right. One of the things that frustrates me the most is when children are treated as substandard human beings. They have voices, opinions, needs and wants, and they have every right to be listened to and respected. Would you ask another adult to hug or kiss someone else? Of course not! Great if your kid wants to give your best friend a hug, but if they don’t how could you force them? It goes against everything we believe in as adults. I’d feel mortified and violated if someone asked me to kiss someone I didn’t want to, and even worse if they forced me. It’s also a completely mixed message, we tell them that people aren’t allowed to touch them without consent but in other situations they are forced into contact that they don’t want. It infuriates me that children aren’t allowed free access to the toilet in school. I get that they should be encouraged to use the toilet in their break times but I have heard many children say that they aren’t allowed to use the toilet in lesson times or that they have asked to go and been refused. In work as adults we are allowed to go to the toilet as and when we please. I can’t imagine a work situation where I would be refused access to the toilet if I needed it. This week my daughter was suffering from a headache at school. Despite crying to her teachers no one did anything for her, or even call me. If an adult had a headache they would take a paracetamol but a child is expected to suffer until the end of the day. I’ve heard so many stories like this, schools are so focused now on their attendance statistics that they won’t send a child home until they are literally throwing up. If an adult felt ill at work they would take the appropriate medicine and go home if necessary, the same should apply to our children. My own scoliosis was diagnosed months after it should have been because no one would listen to my concerns about my developing body shape. I will always take my children’s worries and concerns over their own health seriously, why wouldn’t you? In many situations we feel as parents and carers that we know best for our children, and of course we have to make decisions every day that they don’t agree with. We’ve all had to battle with unreasonable toddler or unruly teenager, but that doesn’t mean that we can’t afford them the same basic rights as we afford all other human beings. I’d love to hear your opinion, leave me a comment below.